UNT departments regularly order apparel from various vendors, but when those orders are able to help the vendor donate shirts to Dallas schools, it’s a win-win situation for all, as UNT Housing and Residence Life recently experienced. After being approached by Joe Williams, the founder of Agape North, about the benefits of ordering t-shirts through his company, Housing decided to give the vendor a try. The established ratio was 5:1, so for every 5 custom shirts or other custom apparel products UNT purchased from Agape North, the company would be able to give one school polo shirt to a student in need locally. Housing placed several orders with Agape North, totaling 1,000 shirts in all. These included Mean Green Move-In t-shirts and t-shirts for the community shirts program. These t-shirts were sold to the residence hall communities as a way for students to show pride for where they live. Every advertisement for the t-shirts indicated that a portion of the money from their sale would help purchase shirts for a Dallas school, so the students knew that their money was going to a good cause. UNT purchased enough shirts from Agape North to cover the cost of a spirit t-shirt for all 475 students at KIPP Truth Academy in South Dallas, which selected t-shirts instead of polos in order to provide for the entire student body. 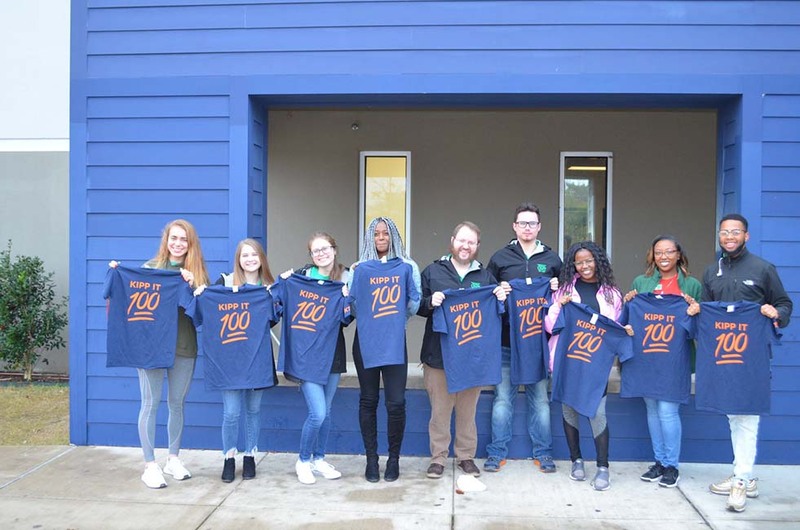 UNT Housing staff and students were able to visit KIPP on November 29 and meet its students, who were happy to show their gratitude for the t-shirts. Partnering with Agape North was simply another way for Housing to demonstrate its commitment to helping others.